In order to assist users that are having connectivity issues, a basic troubleshooter has been developed that checks the communication between the desktop client and the Scheduler Service as well as between the client machine and our servers. The check between the client machine and our servers is performed automatically by the Scheduler Service approximately every twelve hours, and both checks are run manually via the Help menu and selecting Check Communication, as shown below. If all of the tests pass, the following message is shown to the user, at which point the dialog can be dismissed by clicking on the OK button, or the tests can be run again by clicking the Check Again button. 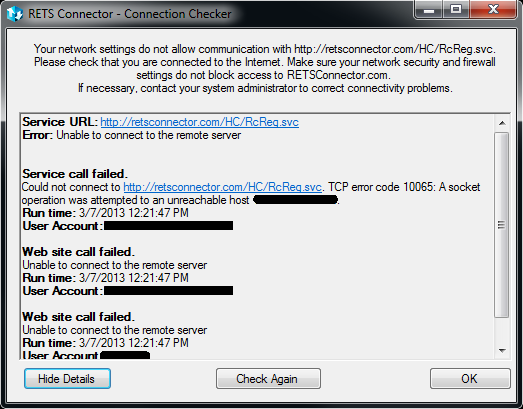 If a problem is discovered, a message similar to the below is shown to the user either upon starting RETS Connector, or on running the Connection Checker manually. 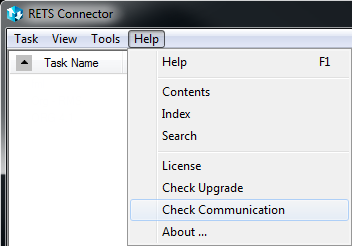 At this point, the user can dismiss the dialog by clicking on the OK button, perform the checks again by clicking the Check Again button, or show the details of the error messages by clicking on the Show Details button. The user will be presented with an expanded dialog similar to the one below.